PAMBE Ghana is dedicated to teaching children to read both in the local Mampruli language and in English. One hurdle is the paucity of early readers written in Mampruli, as it is primarily a spoken language. Shortly after La’Angum Learning Center opened in 2008, PAMBE Ghana teamed up with Ghana Institute of Linguistics Languages and Bible Translation (GILLBT) to produce early readers in the Mampruli language. OKC’s Bricktown Rotary Club funded the project, providing the early readers for La’Angum Learning Center (LLC). First, the grant will provide replacements for the first books, which have worn out after years of exposure to the climate in rural Ghana and many little hands. In addition to the replacements, the Club is funding more story books and alphabet/phonics books for LLC. Second, To support English language reading skills, PAMBE Ghana recently partnered with a British organization “Let’s Read Ghana”, which conducts 2-day teacher training courses for teaching phonics and reading skills to young children. Funded by the Bricktown Rotary Club grant, LLC teachers traveled to the nearby town of Sirigu and participated in the training course last summer. The funds also allowed LLC to purchase early reading primers in the English language, including Have you seen the girl? Third, the Bricktown Rotary Club supported our lending library project at LLC, by funding the shipment of 1750 donated books on a cargo ship from OKC to Accra and the materials and labor needed for construction of library bookshelves by local artisans. Susan Kovats: What is the mission of the Rotary International? Chuck Shirley: Rotary International is a civic service organization that began with an international focus. One of their first goals was to eradicate polio. Rotary fosters connections between communities, and local clubs often reaching out to provide aid via other national and international clubs during disasters. For example, Rotary Clubs all over the world supported recovery efforts after the devastating Moore tornado in 2013. This spirit informs the Bricktown Rotary Club, which works on international projects as well as projects in the OKC community. SK: Tell us about the Bricktown Rotary Club and the motivation to support PAMBE Ghana. CS: One of the 6 pillars of Rotary International is literacy. Our first grant to PAMBE Ghana supported the printing of early readers in the Mampruli language. We saw the impact of those books on the children’s reading skills and we were impressed by the accomplishments of PAMBE Ghana as the first cohort of children graduated from 6th grade last year. Our members were excited about the opportunity to once again work with PAMBE Ghana to help the children of La’Angum Learning Center acquire literacy in the Mampruli and English languages. 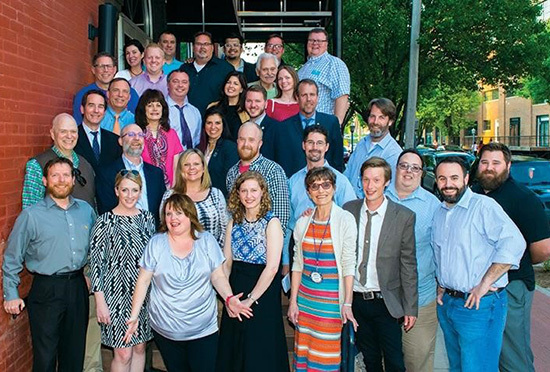 Bricktown Rotary is a club of younger professionals who are do’ers. We are committed to the community and to each other. In addition to fundraising, members enjoy “hands on” volunteering for local projects. This year members hope to volunteer at the PAMBE Ghana Global Market. SK: Which factors underlie your personal motivation to work with Bricktown Rotary Club and serve as president? CS: As I progressed toward a Master’s Degree in Business, I was exposed to volunteering, and I realized that I wanted to be more involved in the community. During an internship in OKC, I was invited to a Bricktown Rotary Club meeting. I found a group of young professionals who wanted to make a difference in the community and to be involved in ways more than simply writing checks. I knew then that I didn’t want to sit on the couch anymore! SK: What sort of local projects does the Bricktown Rotary Support? CS: We have supported Chain Reaction – a donated bike program for the homeless and North Winds Living Center – a hospice for persons living with HIV/AIDS. We also sponsored the dragon boat team of NewView Oklahoma - an organization of the visually impaired, and built a tree house for the Boys and Girls Club.